When Tina Petway, Associate Curator of Malacology, retired as a schoolteacher in 1999, she finally embarked on fulfilling her dream since she was 12 years old. Growing up, Petway was frustrated by the lack of resources for young women interested in scientific careers. This lady was none other than Mildred Tate, a renowned malacologist who helped found the Brazosport Center for the Arts and Sciences in Clute, Texas. Tate gave Petway rare specimens, many books, and a strong foundation for future adventures. 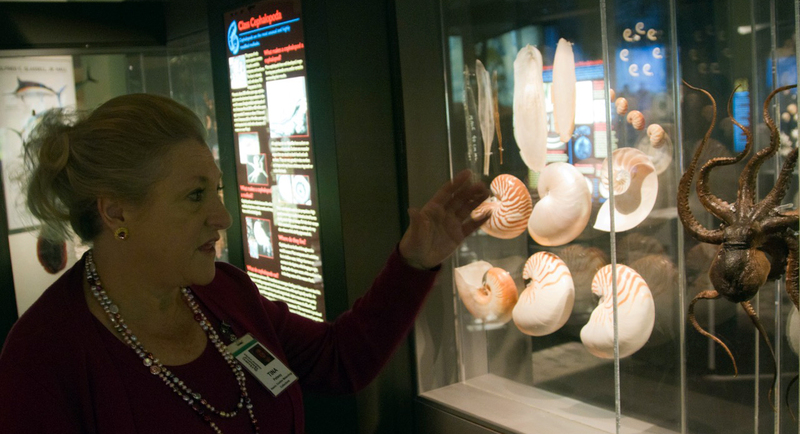 Associate Curator of Malacology Tina Petway pursued shell science later in life. Now she’s an asset to the Houston Museum of Natural Science’s malacology program, and she is full of stories. Though Petway loved teaching, her passion was malacology. She had a brief stint as an interior decorator right after she finished school but then realized just how precious her shells were to her. The walls of model homes were too static for her, so Petway added some shells and coral specimens from her personal collection to liven things up. “Well that went over really well and people wanted to buy them. I didn’t want to part with what I had! So that didn’t last too long,” Petway said. She joined the Houston Shell Club (now the Houston Conchology Society) when she was 16 years old and never looked back. Soon, she was dragging her husband around all over the world looking for rare and exotic specimens. The couple met by coincidence near a family member’s bayhouse, and Petway knew they would get married after just a few months. The pair were together on an uninhabited island in the Solomon Islands chain in 1972 when Petway had an encounter with a venomous cone snail, a group of gastropods that Petway says is her favorite family of mollusks. These snails are carnivores that use venomous barbs loaded with a cocktail of neurotoxins to kill prey. Even today, there is no antivenin. According to Petway, the way to survive is to load up on antihistamines so you keep breathing and use meat tenderizer to draw out the venom. Petway discusses the anatomy of an octopus and other cephalopods in the Strake Hall of Malacology. Petway was collecting specimens in small jars when she saw a cone snail scurrying along the reef. Recognizing it as venomous, she picked it up from the base with her right hand, pointing the aperture and barb down and away from her hand as she maneuvered to get a jar and open it. At that time, another cone snail appeared, and Petway couldn’t resist. She transferred the snail to her other hand, picked up the new specimen and put it in the jar. At around that time, she felt a shooting pain in her left hand. Petway looked at her left hand and saw that the cone snail had emerged, swung around and stung her on her pointer finger three times. She was 30 miles from the nearest airplane, three miles from the nearest habited island, and too far away for modern medicine to help. Of course, the first thing she did was put the snail in the jar for safe keeping; she still has it to this day. “I thought, ‘Whoa, I don’t feel good.’ My head was hurting, my eyes were starting to get fuzzy, I was having a hard time breathing, my heart was pounding, and it was then that I accepted that, ‘Dang it, I’ve been stung!’” Petway said. She hurried to the shore, took lots of antihistamines, wrapped meat tenderizer in a papaya leaf around her finger, and laid down. At that point, she was having difficulty walking, things were blurry, and her breathing was labored. Petway thought, “‘Well if this is it, I went a really cool way.” What else can you say at a time like that? The next day, the headache was still there, but her vision had cleared. The headache would remain for about a month, and it was over 10 years before Petway regained full use of her pointer finger. 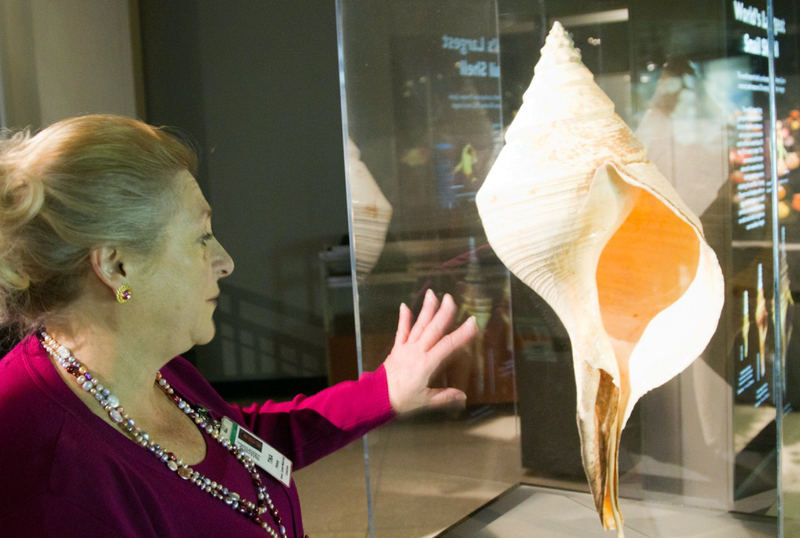 Petway explains the features of the Australian trumpet shell, the single largest shell in the world and the crown jewel of the Strake Hall of Malacology. Petway estimates that the snail who made the shell was more than 100 years old. Petway began volunteering at the Houston Museum of Natural Science in 1999 when John Wise was the curator of the Strake Hall of Malacology. 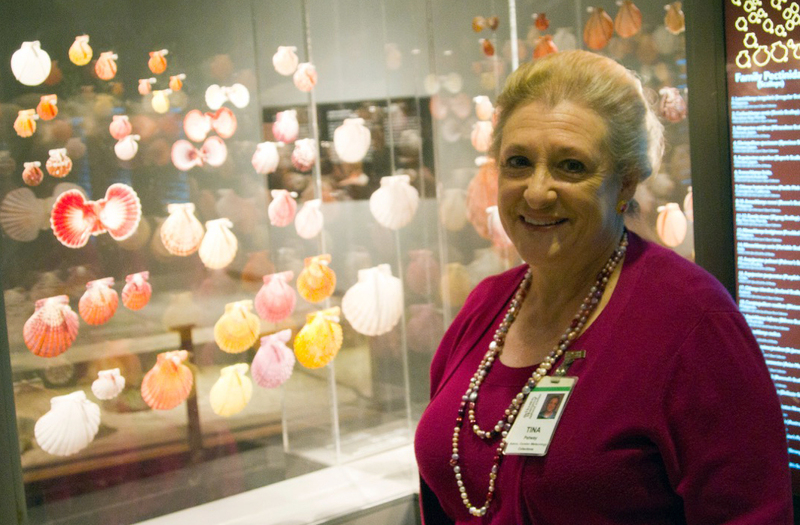 When Wise left in 2005, Vice President of Collections Lisa Rebori asked Petway if she could fill in for a while. “I said sure, of course! At that point, I had been through the whole collection and had pretty much self-cataloged everything that we had and had even started rearranging,” Petway said. “I just kind of started one day a week helping out, and I’ve been here ever since, and you can’t run me off. Petway has led the way in a massive undertaking to revamp the Strake Hall of Malacology. Already known around the world as the premier collection of shells, HMNS has over 2.5 million specimens in storage and is working on purchasing more. The new hall will feature more rare specimens and more educational information about mollusks and their habitats. “There is so much to learn about these animals, and that’s what we want to teach in this new hall. They’re not just pretty, and they are beautiful, but the animals that makes the shells are even more beautiful,” Petway said. Petway is very passionate about conservation efforts for the world’s oceans and is a strong believer that education is a great method to promote the importance of these habitats. She is hopeful that the new hall will help convey that message to future generations. It’s something she’s been seeing her whole life. Museum Collections: Cooler than it Sounds!